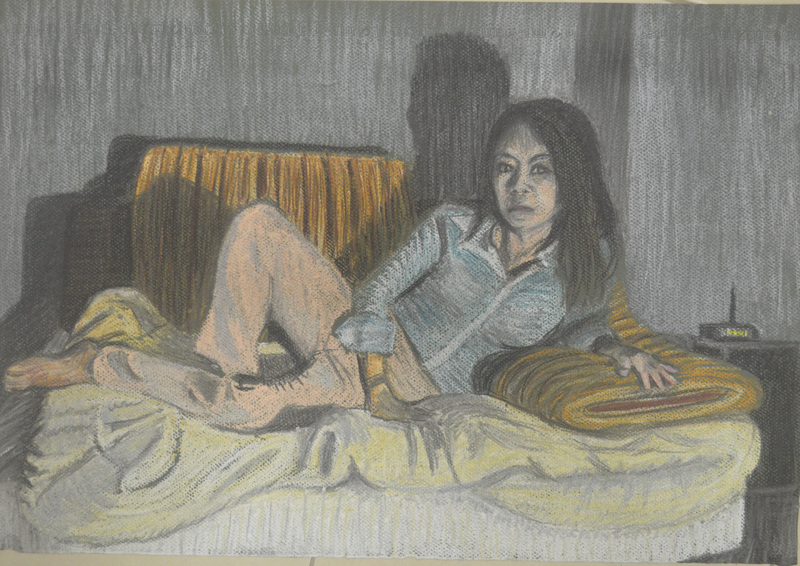 For this part of the assignment I had to pose my model in a reclining position, such as lying back in an arm chair or with feet up extended on the sofa. That’s about all you can do really living in a one bedroom condominium with not much furniture you can lay down on, the choice was either bed, lay-z-boy or sofa, I went for the recliner. We were instructed to dress the model in contrasting clothes,light top, dark pants etc. she wore the same white top as in the first part of this assignment but this time put on a pair of dark blue stretched pants. 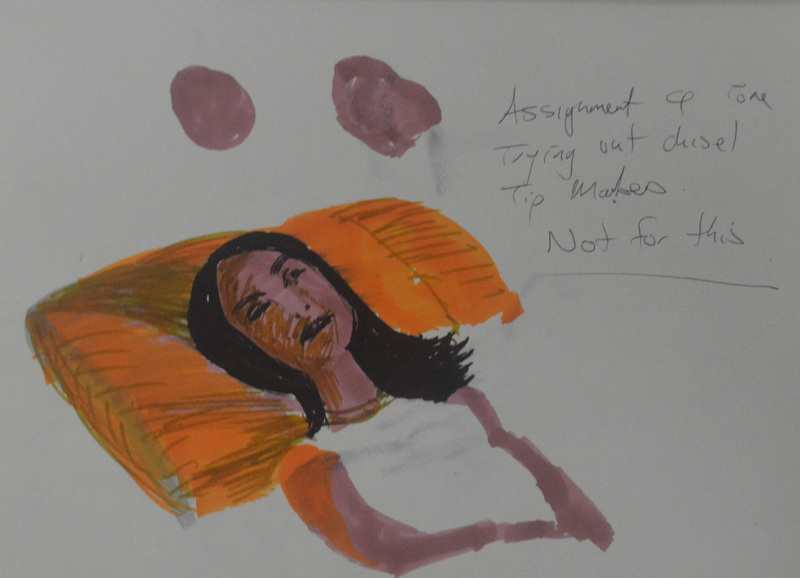 My first quick sketch was in marker pens, using the same Chisel tipped marker pens that I used for both the using Markers and Dip Pens exercise and the Patrick Caulfield Research point. Even though they are nice and vibrant I decided against using them for this part of the assignment after just a quick study of her face and upper body. 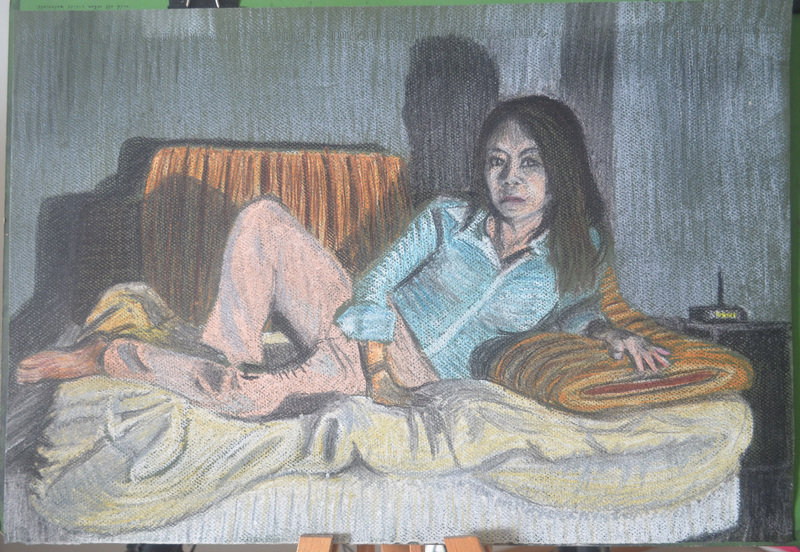 I liked my self portrait in Conte Pencils on blue ingres paper so much that I thought it would be a great medium to have a go with for this part of the assignment. But after a small 30 minute sketch with these on a A4 size sheet of the same blue ingres I decided they weren’t blending well enough for my liking. Also the pose that I chose for the drawing which was looking at her from the front and just slightly to the side didn’t show her form off as much as I should be doing in this part of the assignment. 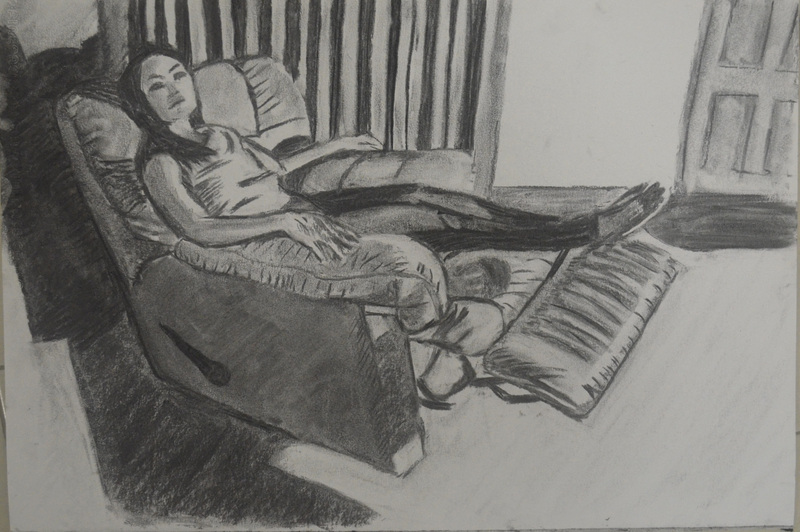 The next drawing was in compressed charcoal on A3 paper this time I sat on a chair almost to the side of her with my light source (my bendy lamp) placed on the floor and facing her from an angle slightly to her left. Although I was happier with both the medium and the angle, I wasn’t happy with not being able to hatch over small areas with a clumsy medium, she needed to be bigger or at a more ‘full on’ angle so I could see more of her. 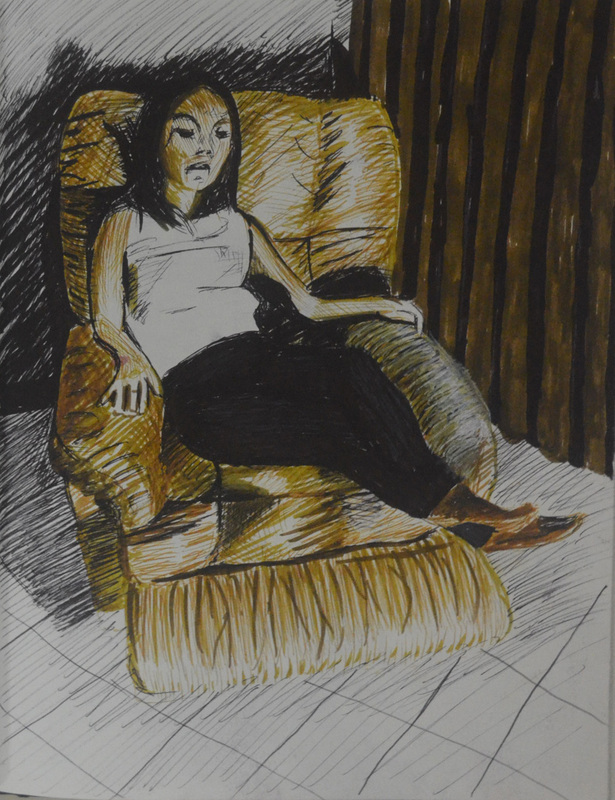 The next study was in my A4 sketchbook with fine nib marker pens, although her face turned into some kind of cat woman the four colours that I chose worked well together although I did mess up on the arm of the chair but this was about describing tone and form and I still wasn’t satisfied that reclining poses in this chair was were allowing me to do that. 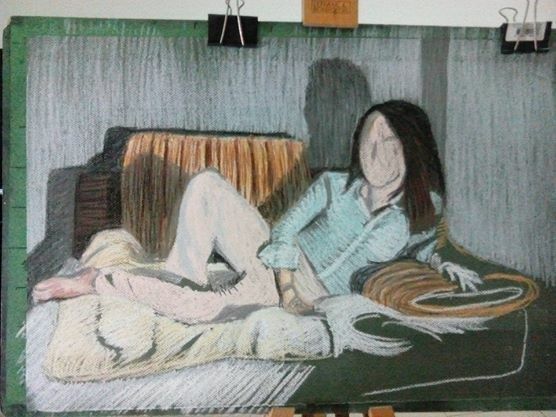 I gave up on it for a couple of days so I could think things through, my bed was against a plain white wall so I didn’t think the background would be interesting enough in there so I thought it might be worth drawing some poses on the sofa, However I had already used the sofa twice already in the three drawings exercise and essential elements and I needed a pose that would fill more of the paper. Two days later I was washing the covers of the sofa when my girlfriend came to visit again. As the sofa covers were in the wash I had a yellow quilt over the white cushion, my girlfriend was wearing a blue striped shirt with white collars and pink trousers and the three colours looked great together. 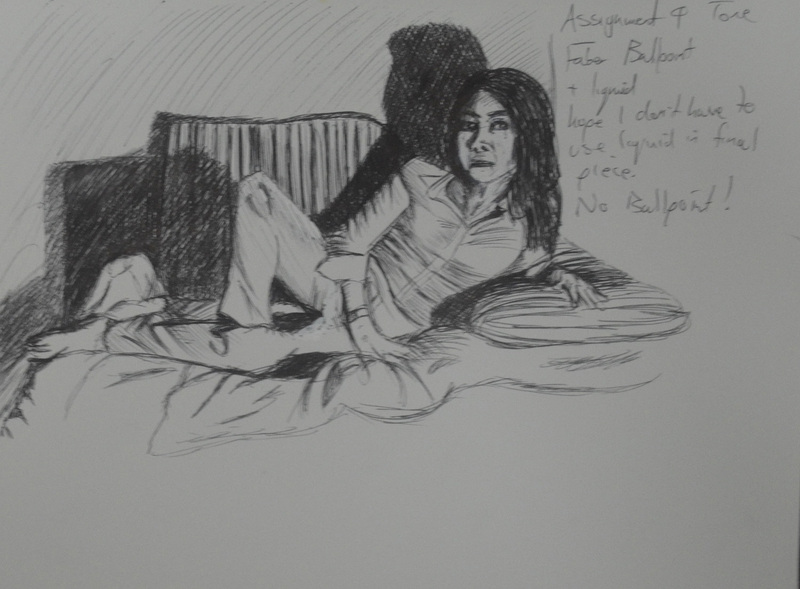 I placed the light sauce on the glass table in front of the sofa so I could create some nice shadows behind her and did a quick 20+ minute drawing in ballpoint pen. After a bit of tampering with Tipex I was satisfied that this was the perfect pose for this assignment. 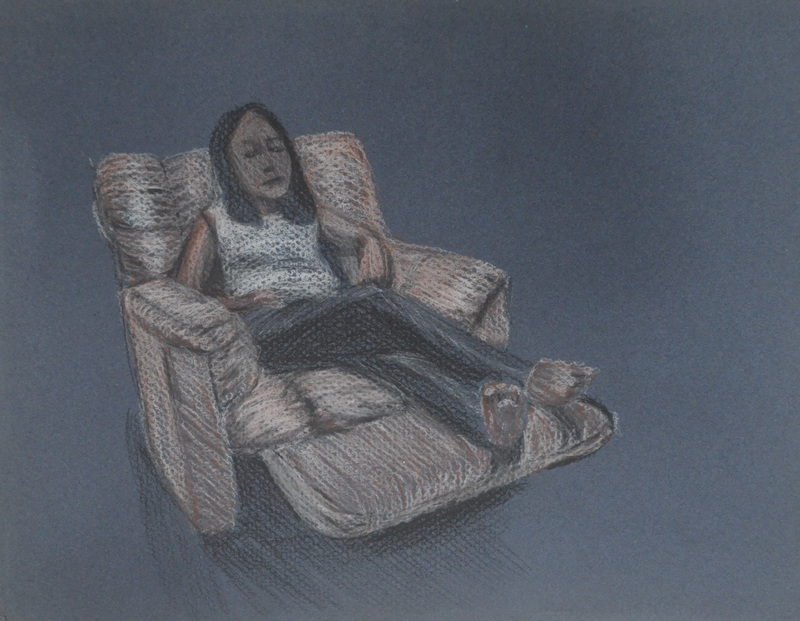 For this drawing I wanted to use a medium that I had only experimented with before, soft pastel. I chose a dark green ingres paper but I didn’t think it would make a difference to how the picture looked as I thought I would be covering every bit of the paper with pastel, this changed as I started hatching realizing that the green of the paper still showed through the pastel strokes which changed the mood of the drawing to how actually imagined it. I completed the whole drawing using hatching and soft pastel except for on the hands and face which I left to last and completed the details in pastel paper. Well I completed this drawing at the end of the month and with hardly any money left I chose to use hair spray as my fixative. I would rather have just framed it behind glass as I thought it was very vibrant before I started spraying away. Nonetheless, it had to be fixed as I presume they have to be sent to England for formal assessment. For now it looks good, the hairspray has aged the drawing and added some character but can it be preserved like it is.